Stockholders Equity (also known as Shareholders Equity) is an account on a company’s balance sheetBalance SheetThe balance sheet is one of the three fundamental financial statements. These statements are key to both financial modeling and accounting. The balance sheet displays the company’s total assets, and how these assets are financed, through either debt or equity. Assets = Liabilities + Equity that consists of share capitalShare CapitalShare capital (shareholders' capital, equity capital, contributed capital or paid-in capital) is the amount invested by a company’s shareholders for use in the business. When a company is created, if its only asset is the cash invested by the shareholders, the balance sheet is balanced through share capital plus retained earnings. It also represents the residual value of assets minus liabilities. By rearranging the original accounting equation, Assets = Liabilities + Stockholders Equity, it can also be expressed as Stockholders Equity = Assets – Liabilities. Stockholders Equity provides highly useful information when analyzing financial statementsThree Financial StatementsThe three financial statements are the income statement, the balance sheet, and the statement of cash flows. These three core statements are intricately linked to each other and this guide will explain how they all fit together. By following the steps below you'll be able to connect the three statements on your own.. In events of liquidation, equity holders are later in line than debt holders to receive any payments. This means that bondholders are paid before equity holders. Therefore, debt holders are not very interested in the value of equity beyond the general amount of equity to determine overall solvency. 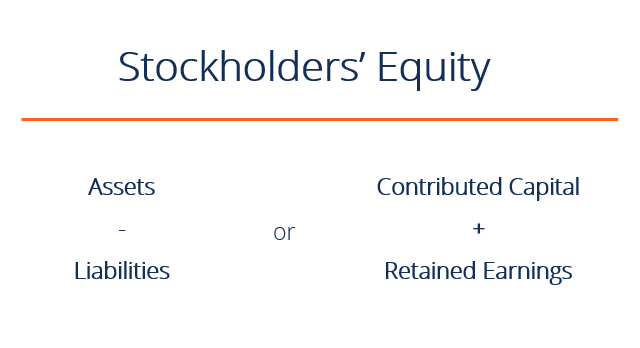 Shareholders, however, are concerned with both liabilities and equity accounts because stockholders equity can only be paid after bondholders have been paid. Share Capital – amounts received by the reporting entity from transactions with its owners referred to as share capitalShare CapitalShare capital (shareholders' capital, equity capital, contributed capital or paid-in capital) is the amount invested by a company’s shareholders for use in the business. When a company is created, if its only asset is the cash invested by the shareholders, the balance sheet is balanced through share capital. Retained Earnings – amounts earned through income referred to as Retained Earnings and Accumulated Other Comprehensive Income (for IFRS only). For more on Retained Earnings, please click the link above. Net Income & Dividends – Net income increases retained earnings while divided payments reduce retained earnings. Contributed Capital (share capitalShare CapitalShare capital (shareholders' capital, equity capital, contributed capital or paid-in capital) is the amount invested by a company’s shareholders for use in the business. When a company is created, if its only asset is the cash invested by the shareholders, the balance sheet is balanced through share capital) refers to amounts received by the reporting company from transactions with shareholders. Companies can generally issue either common shares or preferred shares. Common shares represent residual ownership in a company and in the event of liquidation and dividend payments, common shares can only receive payments after preferred shareholders have been paid first. The share subscriptions receivable functions similar to the accounts receivable (A/R) account. Once the receivable payment is paid in full, the common shares subscribed account is closed and the shares are issued to the purchaser. A few more terms are important in accounting for share-related transactions. The number of shares authorized is the number of shares that the corporation is allowed to issue according to the company’s articles of incorporation. The number of shares issued refers to the number of shares issued by the corporation and can be owned by either external investors or by the corporation itself. Finally, the number of shares outstanding refers to shares that are owned only by outside investors, while shares owned by the issuing corporation are called treasury shares. Where the difference between the shares issued and the shares outstanding is equal to the number of treasury shares. Retained Earnings (RE) are a business’s profitsNet IncomeNet Income is a key line item, not only in the income statement, but in all three core financial statements. While it is arrived at through the income statement, the net profit is also used in both the balance sheet and the cash flow statement. that are not distributed as dividends to stockholders (shareholders) but instead are allocated for investment back into the business. 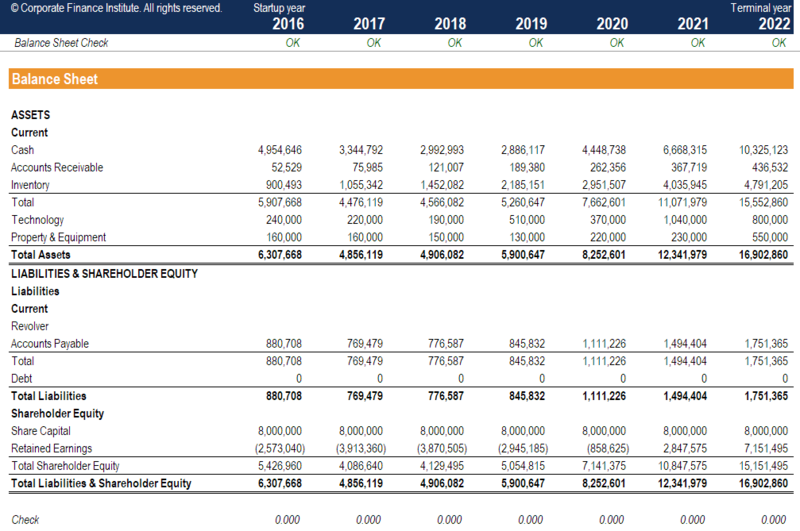 Retained Earnings can be used for funding working capitalNet Working CapitalNet Working Capital (NWC) is the difference between a company's current assets (net of cash) and current liabilities (net of debt) on its balance sheet. It is a measure of a company’s liquidity and its ability to meet short-term obligations as well as fund operations of the business. The ideal position is to, fixed asset purchases, or debt servicing, among other things. To calculate retained earnings, the beginning retained earnings balance is added to the net income or loss and then dividend payouts are subtracted. A summary report called a statement of retained earnings is also maintained, outlining the changes in retained earnings for a specific period. Learn more in CFI’s Retained Earnings guide. Dividend payments by companies to its stockholders (shareholders) are completely discretionary. Companies have no obligation whatsoever to pay out dividends until they have been formally declared by the board. There are four key dates in terms of dividend payments, two of which require specific accounting treatments in terms of journal entries. There are various kinds of dividends that companies may compensate its shareholders, of which cash and stock are the most prevalent. With various debt and equity instruments in mind, we can apply this knowledge to our own personal investment decisions. Although many investment decisions depend on the level of risk we want to undertake, we cannot neglect all the key components covered above. Bonds are contractual liabilities where annual payments are guaranteed unless the issuer defaults, while dividend payments from owning shares are discretionary and not fixed. In terms of payment and liquidation order, bondholders are ahead of preferred shareholders, who in turn are ahead of common shareholders. Therefore, from an investor’s perspective, debt is the least risky investment, and for companies, it is the cheapest source of financing because interest payments are deductible for tax purposes and also because debt generally offers a lower return to investors. However, debt is also the riskiest form of financing for companies because the corporation must uphold the contract with bondholders to make the regular interest payments regardless of economic times. Calculating stockholders equity is an important step in financial modelingWhat is Financial ModelingFinancial modeling is performed in Excel to forecast a company's financial performance. Overview of what is financial modeling, how & why to build a model. A 3 statement model links income statement, balance sheet, and cash flow statement. More advanced types of financial models are built for valuation, plannnig, and. This is usually one of the last steps in forecasting the balance sheet itemsProjecting Balance Sheet Line ItemsProjecting balance sheet line items involves analyzing working capital, PP&E, debt share capital and net income. This guide will break down step-by-step how to calculate and then forecast each of the line items necessary to forecast a complete balance sheet and build a 3 statement financial model.. Below is an example screenshot of a financial model where you can see the shareholders equity line completed on the balance sheet. To learn more, launch our financial modeling courses now!